Neighborhood Potlucks: What Should You Bring? Potlucks are a common holiday tradition across the country. The most famous potluck in history is the first Thanksgiving dinner when the pilgrims broke bread with the Wampanoag tribe. Ever since then potlucks have been a popular way to bring people together during the holiday season. Taking part in a potluck means contributing to the group. After all, the definition of a potluck is a meal or dinner in which each guest contributes a dish. Which one should you bring? Use these tips to decide! Before making a trip to the grocery store, take a moment to give your potluck dish some thought. There’s nothing worse that bringing the dish that barely gets touched. You may have to put your personal preferences aside and consider what’s most likely to appeal to the entire group. How many people are on the guest list? What’s the ratio of kids to adults? Does anyone have food allergies or limitations? Is there a theme to the party? Is there a list of recommended dishes? Answering all of these questions can point you in the right direction. For a holiday potluck the natural choice is a seasonal dish. But what if your recipe repertoire is limited? Or you’re known for a delicious dish that isn’t necessarily holiday fare? Unless everyone agrees to bring traditional holiday food, you’ve got some leeway. If you choose to bring a non-traditional dish, come up with other ways to make it more festive. For example, you can put it in a container that’s decorated with holiday colors and imagery. It may also be possible to add color to the food itself or substitute an ingredient to make the dish more holiday-inspired. Another consideration is what’s eaten locally. Food is very regional. If you’ve just moved to a new neighborhood from out of town find out what the locals like to eat. Or you could decide to share a holiday dish that’s traditional where you used to live. 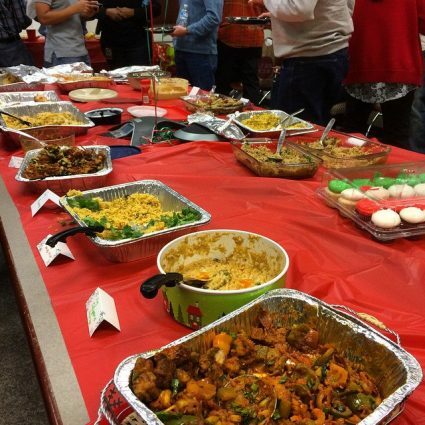 Here’s a look at how diverse holiday food can be across the country. Even if you’ve never lived in Texas, you probably already know BBQ is a big deal in the Lone Star State. Bar-be-cue smoked turkey is a favorite at just about any dinner table. Since Texas is one of the largest producers of pecans it’s also quite common to see pecan pies for dessert. It’s no secret that Ohioans love the Buckeyes. So much so, peanut butter fudge buckeye candies are a holiday staple. In southern Florida the Cuban tradition of roasting a pig is popular around Christmas. You might also see Floridians up north eating freshly shucked oysters at holiday get-togethers. Dungeness crab dishes are common during the holidays in the Northwest since the season kicks off in December. If you’re in Hawaii for the holidays you’ll probably enjoy a kalua turkey. Instead of using a turkey fryer, the bird is wrapped in banana leaves and slow roasted in an underground earth oven. In the Northeast there are a few ingredients that make their way into a lot of holiday dishes. For example, maple syrup and molasses are in abundance during the holidays. They don’t call it Virginia ham for nothing. During the holidays you’re just as likely to see pork at holiday celebrations in the Mid-Atlantic as you will poultry. Apples are also freshly picked and put right into foods and beverages. The Midwest is all about hearty, warm dishes during the winter. The produce-rich region is known for mashed potatoes and rich green bean casseroles. Soul food and the south go hand-in-hand no matter what time of year it is. The region is also steeped in holiday food traditions like cooking a variety of greens in pork stock and serving dessert-worthy dishes like sweet potato casserole during dinner. Potlucks are almost always buffet style events. If it’s for the entire neighborhood the potluck may be happening at a community center or someone’s house. You can’t ever assume there will be extra oven or refrigerator space. Try to find out ahead of time how things will be served and if you need to supply any extras like serving spoons or a cooler. You’ll also have to take other logistics into consideration depending on the dish. Hot dishes will need a way to be kept warm and could be harder to transport. Serving out of a crock-pot is also common, but you’ll need to make sure you have a power source nearby. Need help moving into a new neighborhood during the holidays? Square Cow Movers can worry about the move so your family can focus on settling in during the holiday season. Call today or use the online form to get an instant moving quote!